We are now up and have a continuous line of troops, and in a few hours will be intrenched from the Appomattox below Petersburg to the river above. Heth’s and Wilcox’s divisions, such part of them as were not captured, were cut off from town, either designedly on their part or because they could not help it. Sheridan with the cavalry and 5th corps is above them. Miles’s division, 2d corps, was sent from the White Oak Road to Sutherland Station on the South Side Railroad, where he met them, and at last accounts was engaged with them. Not knowing whether Sheridan would get up in time, General Humphreys was sent with another division from here. The whole captures since the army started out gunning will amount to not less than twelve thousand men, and probably fifty pieces of artillery. I do not know the number of men and guns accurately however.… I think the President might come out and pay us a visit tomorrow. 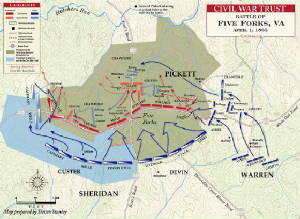 During the night of April 2d our line was intrenched from the river above to the river below. I ordered a bombardment to be commenced the next morning at five A.M., to be followed by an assault at six o’clock; but the enemy evacuated Petersburg early in the morning.